Since it’s commissioning in March 1965, SAFARI-1 has achieved many outstanding successes, but after 1995 it became one of the top three nuclear reactors in the world concerning safe and reliable operations with the aim to serve all stakeholders for more than 20 years at ~300 operational days. SAFARI-1 is currently engaged in many activities which are not only fascinating but also of great benefit to humankind. Historically the highly enriched uranium (HEU) fuel for the reactor was produced on-site from the South African HEU inventory. The conversion of the SAFARI-1 reactor to low-enriched uranium (LEU) fuel was completed in 2009. Spent fuel from the reactor is stored in the reactor pool for short periods after which it is transferred to a dry underground storage facility on site. Initially SAFARI-1 provided many academic degrees (PhD’s), other research papers and research programmes provide opportunities in research over the years and also many products and services both locally and internationally to various industrial and institutional sectors, proving that nuclear technology does indeed offer many beneficial applications in public community and continue still today. In 1998 SAFARI-1 was awarded the prestigious SABS ISO 9001 certificate for compliance to international quality standards. At the time, it was the second nuclear reactor in the world to receive this award. The ISO 9001 accreditation then recognizes the ability of SAFARI-1 to operate as a production facility within the international safety standards of design and production in providing quality products and services to industry for the local and international community. SAFARI-1 had subsequently in 2003 also received the SABS ISO 14001 Environmental Management Certificate. SAFARI-1 utilizes an overall Quality Management System (QMS) which not only encompasses environmental controls but also includes product quality radiological and conventional safety and security systems. Furthermore, it became one of the first research reactors in the world to achieve all three certifications by receiving in 2011 also the OHSAS 18001 certification for occupational health and safety. The SAFARI-1 research reactor became one of Necsa’s cornerstone facilities especially during the mid 1990’s where it’s main application was to be a cost sustainable facility operating as a commercial production facility of radioisotopes and rendering of irradiation services to all stakeholders. During this time period, moving away from a Monday to Friday research operating programme and a low utilised reactor, the utilization become extremely high and the reactor reaches after 30 years of operations the first 1 Million Mega Watt hours (1000GWh) in 1995 of total energy production since first startup, then 8.8 years later in 2003 the 2 Million MWh (2000GWh) and then 7 years later in 2011 the 3 Million MWh (3000GWh), shows the significant change in utilisation and SAFARI-1 is now approaching the 4 Million MWh (4000GWh). Ofcourse this also demands a specially qualified and skilled workforce to support the operational programme in all disciples of engineering, nuclear science, maintenance, operations, radiation protection, regulatory and licensing, conventional and nuclear safety, quality and environment aspects, waste management as well as security. The last 21 years since 1996 required a high utilization for commercial purposes. 1965: First criticality in March 1965 - after which the reactor operated at 6.67 MW thermal power using HEU fuel of US origin with an enrichment of 93%. 1968: The reactor was shut down for approximately 9 months to upgrade the heat removal systems for 20 MW operation. 1977: Due to political pressure the US fuel supply to SAFARI-1 was stopped, prompting a reduction in reactor operation to 5 MW and during weekdays only. 1981: Locally manufactured Medium Enriched Uranium (45% Enriched) fuel was supplied for the first time. The reactor continued to be operated at 5 MW on a weekday schedule for the next 12 years. 1988: The reactor was shut down for an extended period of 6 months to effect repairs to the pool liners. 1993: The start of a commercially oriented utilization programme led, for the first time in 16 years to a progressive increase in reactor power higher than 5 MW. Initially, at 10 MW but between 1995 and 2000 the power was further increased to 18 MW average, and ultimately to 20 MW over the last 10 years. 1994: Enrichment of locally produced fuel elements was changed from MEU to HEU, with a 235 U content of 200g. 1995:One million MWh (1000GWh) total energy production since first start up. 2000: The 235 U content in locally manufactured HEU fuel elements was increased from 200g to 300g. 2003: Two million MWh (2000 GWh) total energy production since first start up. 2007: The first two LEU lead test fuel elements (340g of 19.75% enriched 235 U) were successfully irradiated in the core. 2008: Core conversion to LEU started. 2009: LEU conversion of the core was completed and regulatory approval for continuous loading of LEU fuel was obtained in August 2009. 2009: Three million MWh (3000 GWh) total energy production since first start up. 2010: SAFARI-1 staff and operation responsibilities were seconded to Nuclear Technology Products PTY (Ltd). 2010: Regulatory approval for commercial production of 99 Mo from LEU target plates was granted. 2018: Currently on 3.86 million MWh total energy production since first start up. Secondly, an annual utilisation factor approaching 90% means that refuelling shut downs are too short for a conventional theoretical approach to support the refuelling process. Thirdly, it has therefore been necessary to develop an approach to routinely refuelling (i.e. refuelling without a change in core configuration) that takes account of all the safety requirements, including a full 3-D theoretical analysis, and yet can be accomplished in the limited time available during a refuelling shutdown. Fourthly, ever changing environment in the regulatory and client/stakeholder requirements requires infrastructure and resources with a dynamic integrated management system to manage and operated the reactor safely within the operating design requirements for 300 days per year. One of the reactor features is its compact core, which maximises the neutron fluxes available to the irradiation, neutron activation and research facilities. Not only are there facilities outside the core region, but also a number of in-core irradiation and activation facilities in the form of pneumatic and hydraulic rabbit positions and thimbles. The design and operation of the reactor and all it’s systems is based on a defence in depth approach and the ALARA principle. The safety objective is the protection of the public, personnel and environment from exposure to radiation and contamination caused by the operation of the reactor and utilisation of the irradiation facilities. All systems and structures are designed with adequate safety margins to ensure that their behaviour under anticipated operational circumstances and occurrences can be predicted. 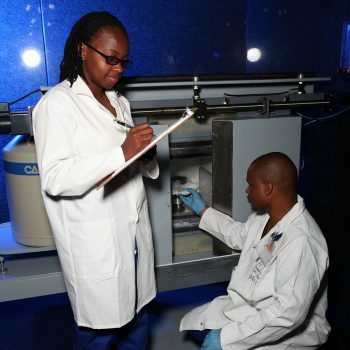 The reactor facility remains recognised as a regional (African) resource and centre of excellence in nuclear science and technology and is highly respected by the international research reactor community. The SAFARI-1 research reactor has been one of Necsa’s key nuclear facilities in the world for more than 20 years and have an excellent track if not the best in the world to sustain it’s operational cycle year after year by operating ~ 300 days a year. On the 18th March 2018 SAFARI-1 is 53 years old and also belongs to the unique club of a few operating research reactors in the world which are 50 years and older since commissioning. It has operated with an exemplary safety record having logged just over 3.96-million MWh to date, without any major safety incidents. It is one of only ten reactors in the world used to help radioisotope producers to provide the world’s Mo99 needs. Using Mo-99 as feedstock, devices are manufactured that allow for over 40-million nuclear medicine diagnostic imaging procedures annually and SAFARI-1 contributed largely to the success of NTP Radioisotopes. 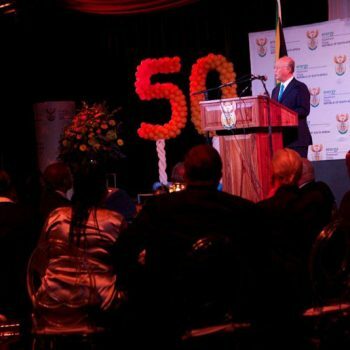 Over the last 53 years of safe operation SAFARI-1 has touched the lives of millions of people related to scientists and engineering in research, Masters and Doctorate degrees, provides currently over 12 Million people annually in South Africa and worldwide to undergoing medical procedures by ensuring nuclear medicine for practitioners and patients. In 1994, the technical feasibility study of conversion to LEU was performed and the economic feasibility study was done initially in 1995. The technical and economic feasibility studies were redone in 2001 for both LEU fuel and MO target plates. The Government announced the approval of the conversion of highly enriched uranium (HEU) to low enriched uranium LEU in 2005. In 2006, the test irradiations of 4 LTA’s LEU fuel assemblies commenced and in September 2008 the full reactor core conversion from HEU to LEU started in 2005 was successfully completed in June 2009. Two years later also for the irradiation of LEU target plates which makes SAFARI-1 one of the first two reactors in the world to utilise LEU fuel assemblies and Mo target plates for production purposes. SAFARI-1 since the signing of the nuclear non-proliferation treaty and South Africa’s comprehensive safeguards agreement obligations SAFARI-1 have an excellent record on the non-proliferation compliant reports and this also enables Necsa to request preferential treatment in key markets such as the US, and to expand the isotope production in international joint ventures. 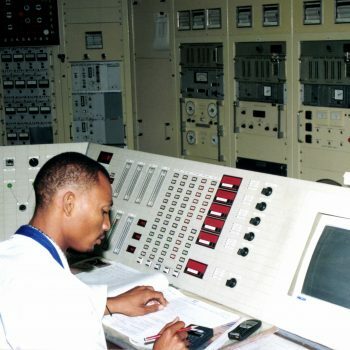 But the work and effort that SAFARI-1 personnel is putting in as a team is not always recognised but the achievements of safe operation and reliability to serve the clients speaks for itself, especially thinking of it’ extreme record of one the world’s best operational history by an ageing operating research reactor and maintaining that for 20 years at ~ 300 operational days. SAFARI-1 is doing this because the team is committed to serving the objectives of stakeholder’s their clients and especially Necsa unconditionally. One of the most important objectives of a nuclear reactor is “Reactor Safety” and this can only be accomplished by having effectively implemented design control and project management processes, maintenance programmes, ageing management systems and training programmes for personnel to execute all activities. In order for SAFARI-1 to maintain an exceptionally high operational level of full power days per year, the planning, implementation and coordination of routine maintenance, in-service inspection, and ageing management system and projects related to upgrades and ageing management need to be well structured and controlled. The effective and efficient implementation of such a management system will ultimately ensure the success of the reactor in the competitive environment. The SAFARI-1 research reactor maintenance programmes were adapted since 1996 with the change in operational schedule to suit the commercial programme (with more emphasis on maintenance and personnel competency) to ensure that systems, structures and components (SSC) continue to operate as required and to meet the design and safety objectives. The maintenance procedures form an integral part of the QHSE management system and prescribe the principles and controls established for periodic inspections and maintenance within the SAFARI-1 facility. These maintenance programmes ensure that plant equipment and related nuclear safety and safety critical equipment or systems, are correctly inspected and maintained in accordance with applicable regulatory requirements and IAEA safety guidelines. A list of ongoing modernisation and refurbishment projects are being done to ensure the continued safe operation of the facility. One of them is currently an extensive Plant Health Status Assessment to ensure safe operational until a second multi-purpose reactor is operational to resume the required irradiation programmes. The identification of the needs of academic institutions regarding the use of beam-port facilities and possibly in-core facilities for the development of student abilities (i.e. graduate and/or Post-graduate) and collaborative research is a prime task allocated to Necsa Radiation Science of R&D Division and must receive the necessary coordination and support from SAFARI-1 now and in the future. SAFARI-1 to operate within / according to the regulatory requirements as prescribed in the licensing conditions (as reflected in the latest approved revisions of the Nuclear Installation License, the Operating Technical Specification (OTS) and the Safety Analysis Report (SAR)) so as to ensure minimum risk to personnel, public and environment is of utmost importance for the continued safe operation and viability of the facility. Therefore SAFARI-1 will be a sustainable operational irradiation facility until at least 2030 or longer pending an engineering assessment supported by ageing management programme and In-Service Inspection results to justify further operation until then. The ageing management programme of SAFARI-1 will continue as a programme to the end-of-life of SAFARI-1. Evaluations of reactor core-component and plant life extension criteria will continue in order to keep focus on the Ageing Management Programme future upgrades, modifications and maintenance requirements whereby SAFARI-1's safe and sustainable long-term availability continues. All the ageing, upgrade, improvement and maintenance projects of SAFARI-1 are periodically re-prioritised, taking into consideration recent operating experience, the projected expected lifetime of the SSCs, the perceived risks and returns, and the availability of resources. As SAFARI-1 does not have sufficient resources to determine a definitive scope, cost and schedule of all the projects, but a strategy is followed where at the periodic re-prioritisation of the projects, the available resources are applied to the highest priority projects, and those projects are then managed under the SAFARI-1 project management procedures. Life beyond SAFARI-1 – another Multi-Purpose Reactor (MPR) will be the future objective for Necsa.